Mexican guacamole is addictive, good for you and popular the world over. What's so special about this guacamole recipe? Tangy Key lime, the real lime of Mexico, lends authenticity to this salad and is the perfect complement for mild avocado. Unlike ordinary lemon, Key lime juice is acidic enough to keep guacamole green for hours. Although you will find variations at the end of this article, fresh garlic isn't included in the basic recipe as it tends to overwhelm avocado's delicate flavor. Which variety of avocado is best for guacamole? Hass and Fuerte are the two most common commercial varieties in the United States. 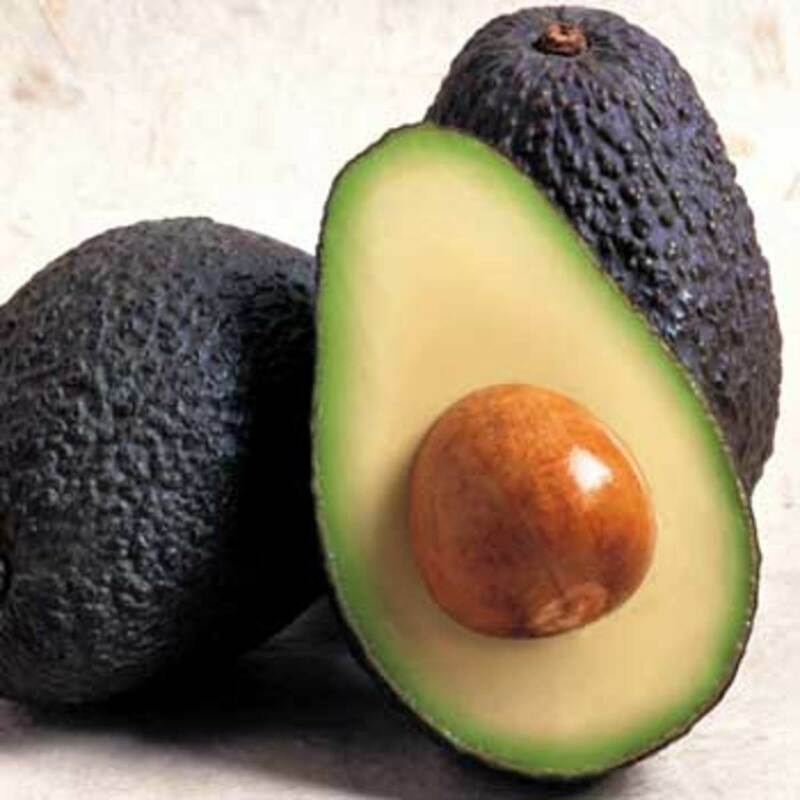 Hass, a small avocado with thick, purplish-black, bumpy skin and creamy flesh, has mostly taken over the U.S. market. If you live in California or outside of the United States you may be able to find Fuerte, considered by many to be the most delicious commercial variety. Of medium to large size with smooth, green skin and rich, yellow flesh this avocado has notes of hazelnut and a citrus, grassy finish. Either avocado makes a memorable guacamole. What inspired this recipe? Last year we traveled to Moquegua, a leafy town in Southern Peru known for its avocado groves. We returned loaded down with bags of the unripe fruit. My musings immediately turned to guacamole: real, authentic Mexican guacamole addictive enough to be eaten by the spoonful. In Moquegua we feasted on avocados for breakfast, lunch and dinner. Usually sliced and spread on bread or cut in half and topped with potato salad, they were so abundant that only bruise-free, perfectly ripe avocados made it to the table. One day our host, Felipe, offered a tour of his avocado grove. As we followed him through the narrow pathways he rattled off names unfamiliar to us: Ettinger, Bacon, Zutano. Stopping at a particularly bushy tree, he grabbed a branch and deftly clipped off a pear-shaped fruit. His eyes flashed with pride. "This is my own hybrid. The flesh melts in your mouth like butter, and it's especially decadent drizzled with wild honey from my own combs." 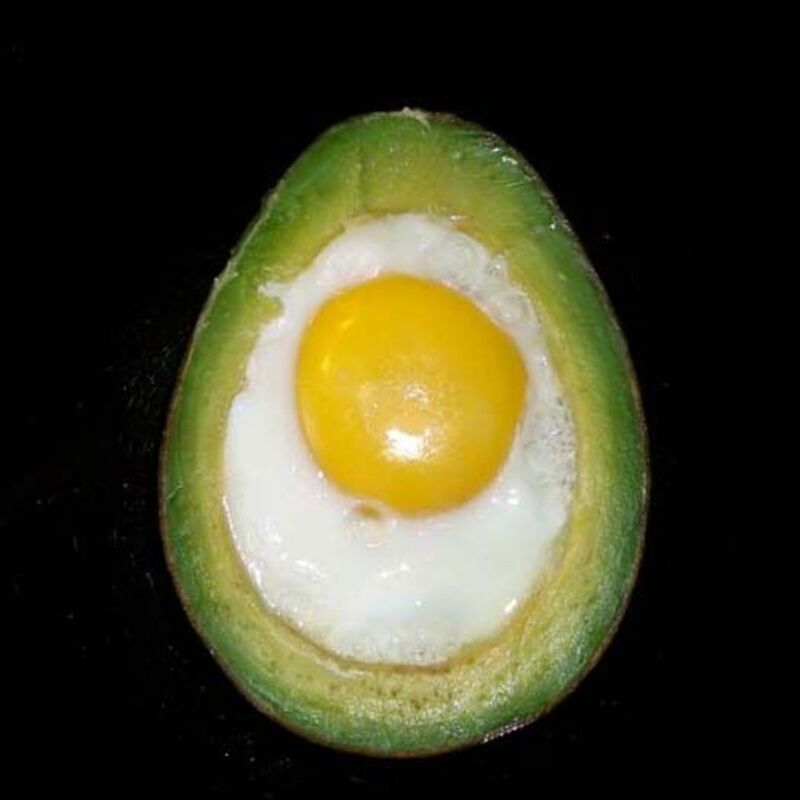 Felipe's sun-baked complexion looked a lot like the skin of the avocado, or palta, he held in his hand. Felipe taught us how to test an avocado for ripeness. With your thumb, press gently near the stem end. If the avocado gives slightly to your touch, it's ready to eat. Stash avocados in a paper bag with a banana to speed up the ripening process. To slow down the process, store them in the refrigerator. We hope you enjoy this delicious and authentic guacamole, inspired by Felipe's avocados. Nestle an avocado pit in the center of guacamole to keep it from oxidizing, or turning brown. Placing a piece of plastic wrap on the guacamole's surface will also do the trick. Plum (Roma) tomatoes or another fleshy variety are the best choice for this guacamole. Be sure they are ripe and flavorful but still firm. Due to the variability of fresh ingredients, taste as you go. Adjust lime and salt to taste. Omit cilantro if you dislike the flavor. 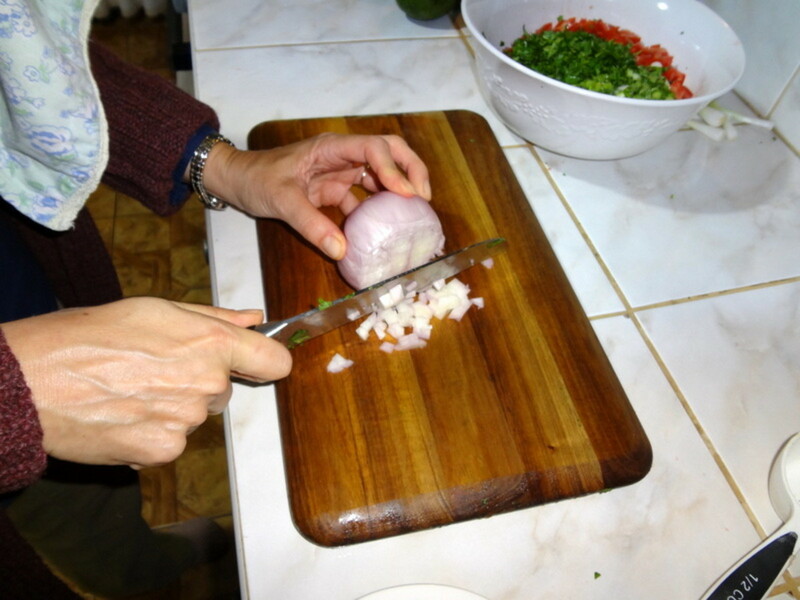 If you don't enjoy raw onion, try diced green onion instead or just omit it. Unforgettable guacamole depends on the quality of the avocados. 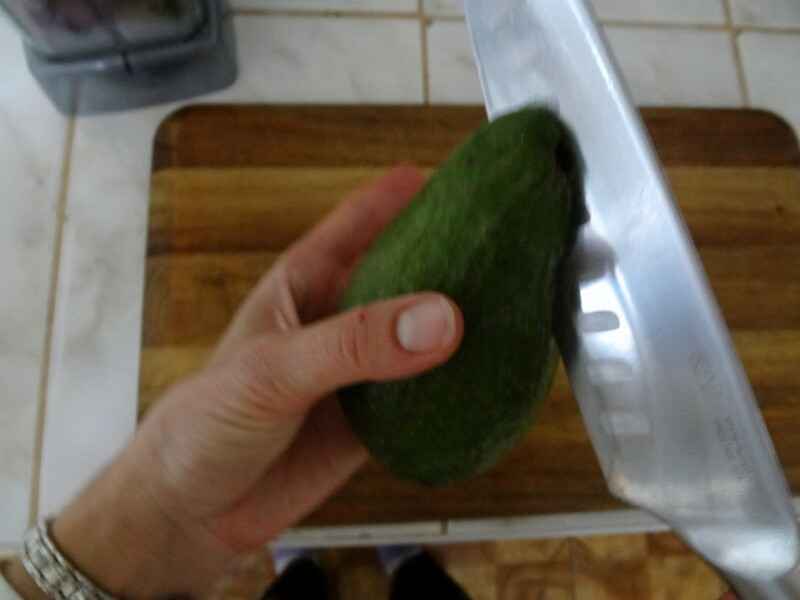 Test avocado flesh by rubbing it between your fingers. If it feels creamy, try chunky guacamole. If it feels watery or firm, make smooth guacamole by smashing with a fork or in a food chopper. Kosher salt is an important choice for guacamole. 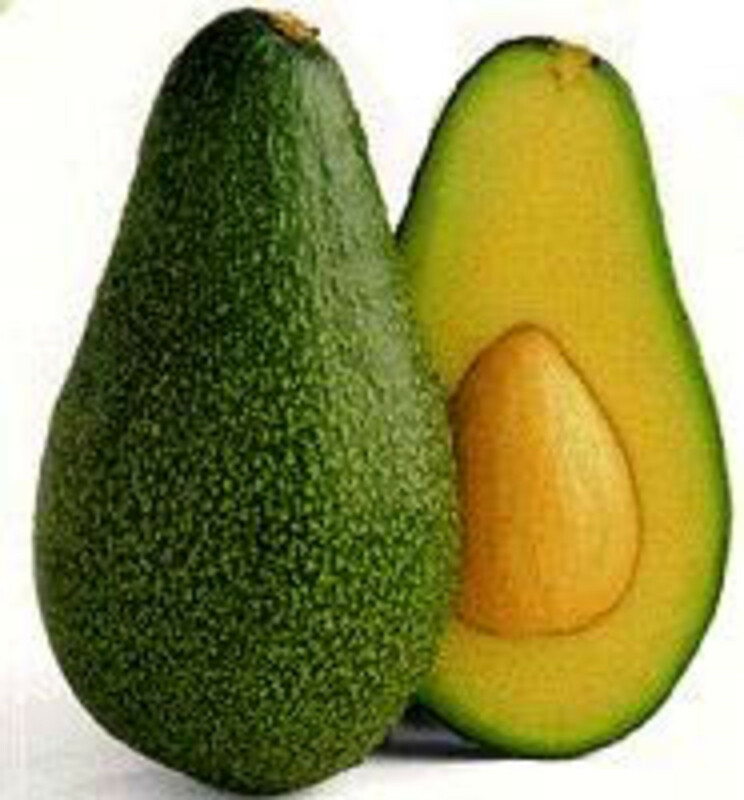 Due to the avocado's delicate flavor and texture, it is easily overwhelmed by the harsh metallic taste of table salt. Kosher salt is great for the rims of your margarita glasses, too! If you can find it, Maldon or pink sea salt is even milder. 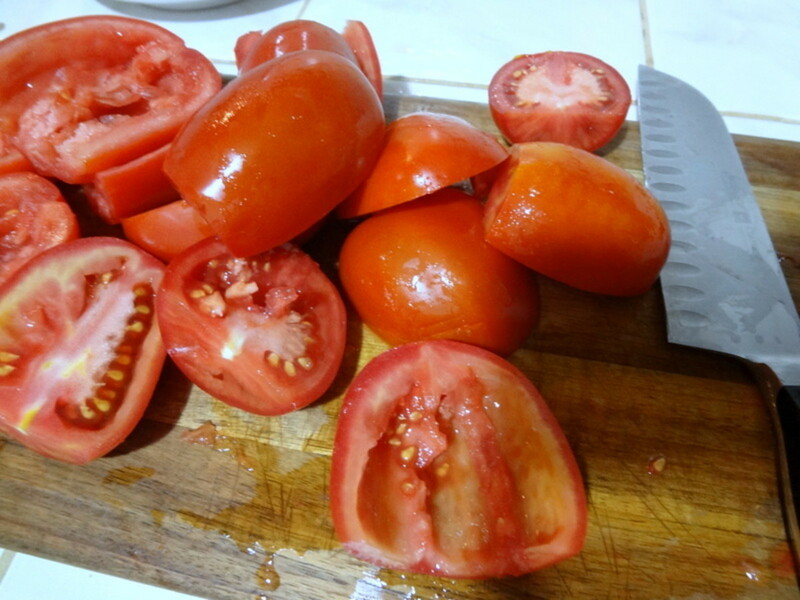 Slice the tomatoes in half and throw away the seeds. Dice the tomatoes and place them in a small bowl. 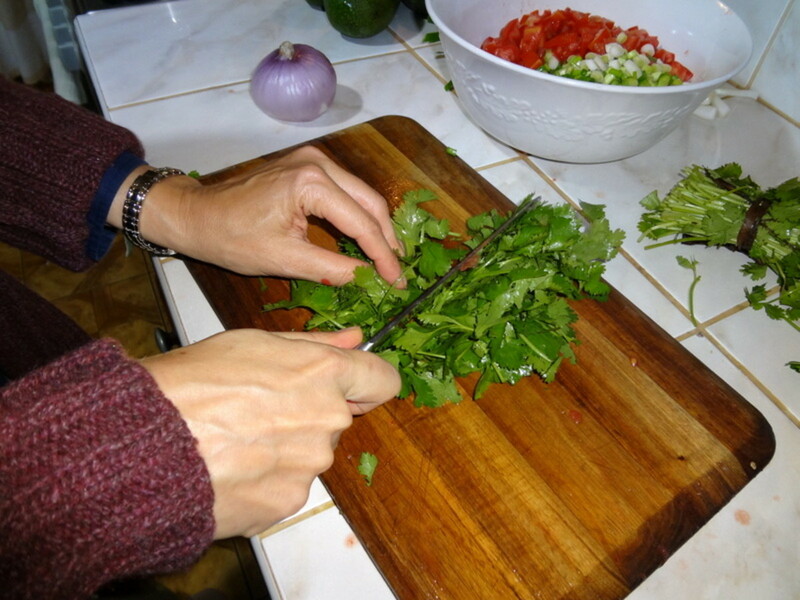 Finely chop cilantro leaves. 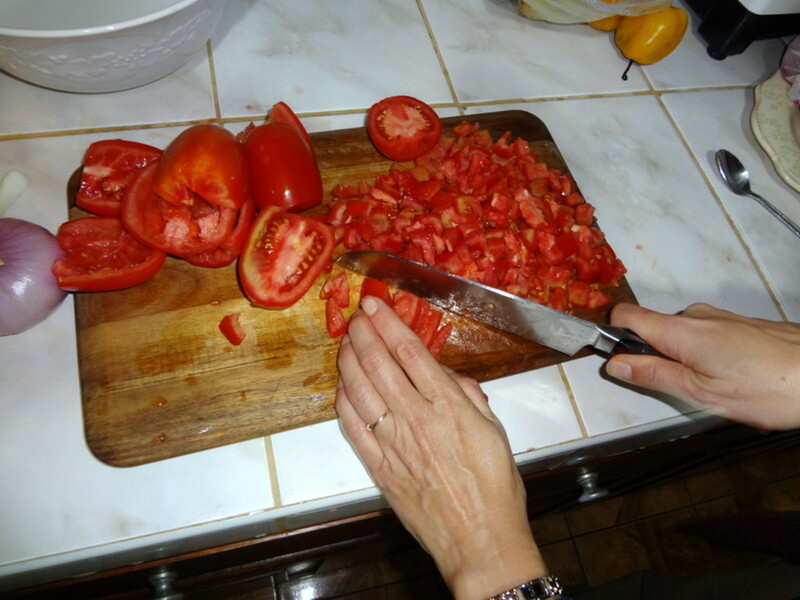 Add about 3 Tablespoons to the small bowl of diced tomatoes. Dice the onion. Combine with tomatoes and cilantro. 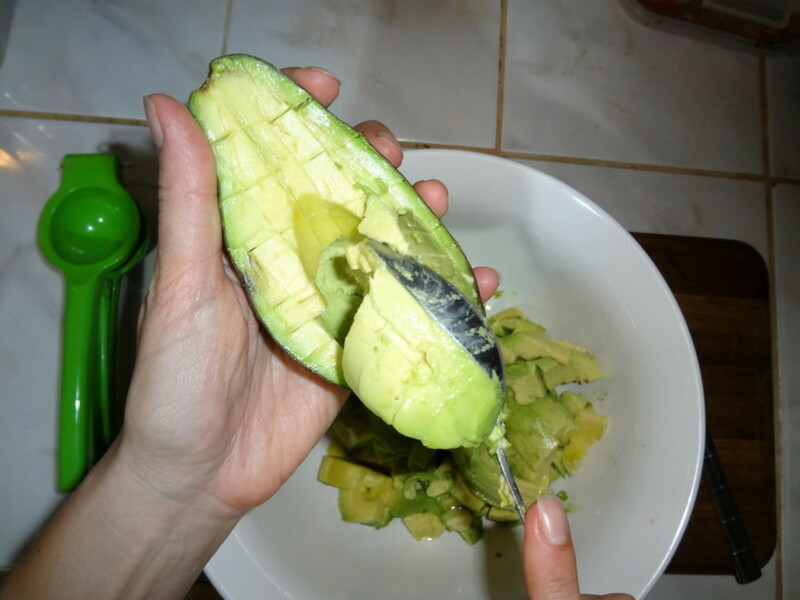 Split avocados and remove the pits. 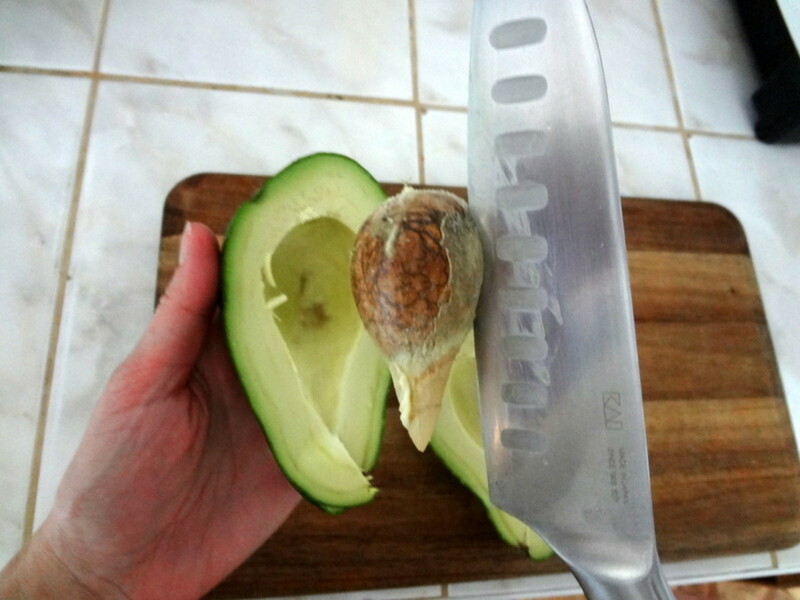 While still in its shell, slice the avocado's flesh left to right then top to bottom. Use a butter knife and try not to cut through the skin. Using a spoon, scoop the flesh from its shell. 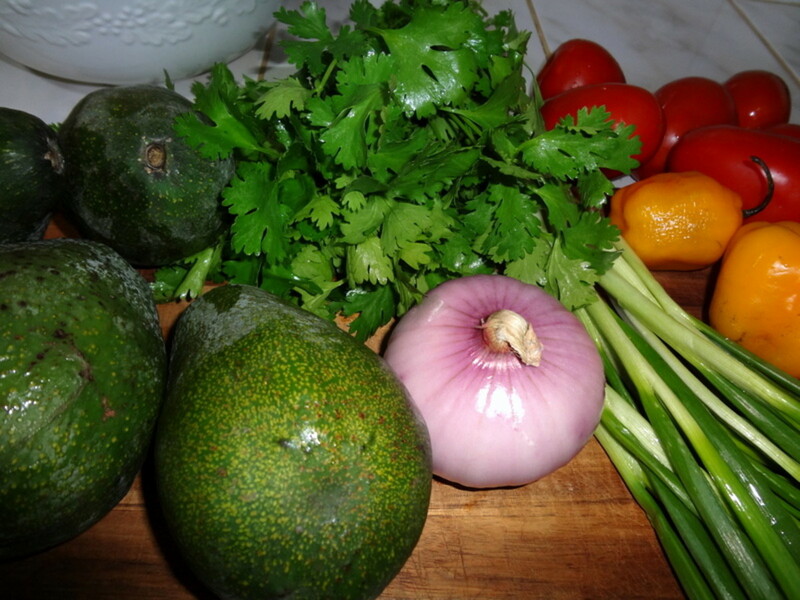 Place avocado in a medium-sized mixing bowl along with 1 cup of the tomato, onion and cilantro mixture. Add kosher salt, lime juice and other optional ingredients. 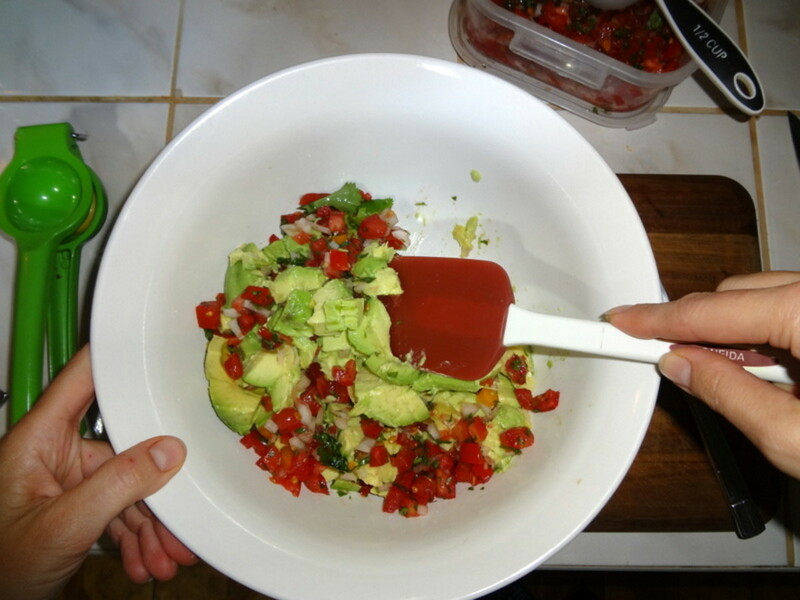 If making chunky guacamole, gently fold ingredients together with a spatula. If the avocado is still firm, you may need to smash it with a fork to achieve a creamy consistency. 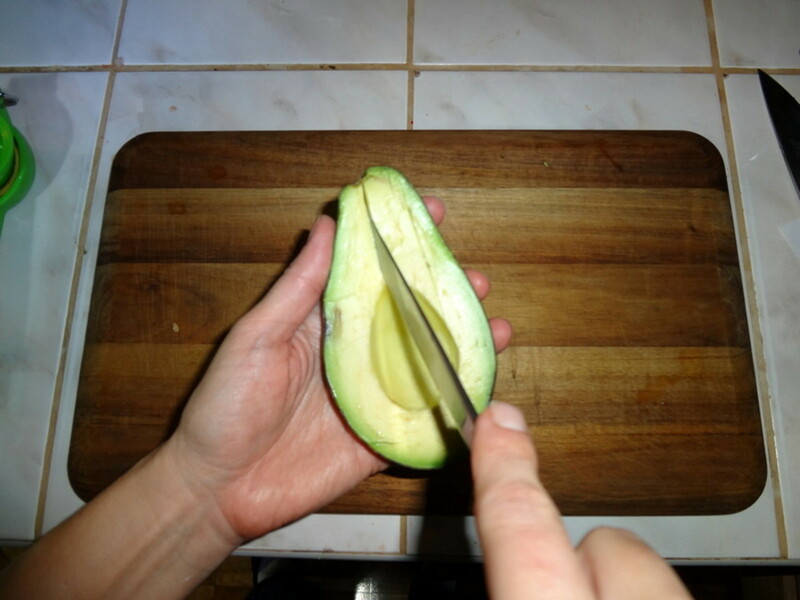 Use a butter knife to slice avocado while still in its shell: top to bottom, left to right. 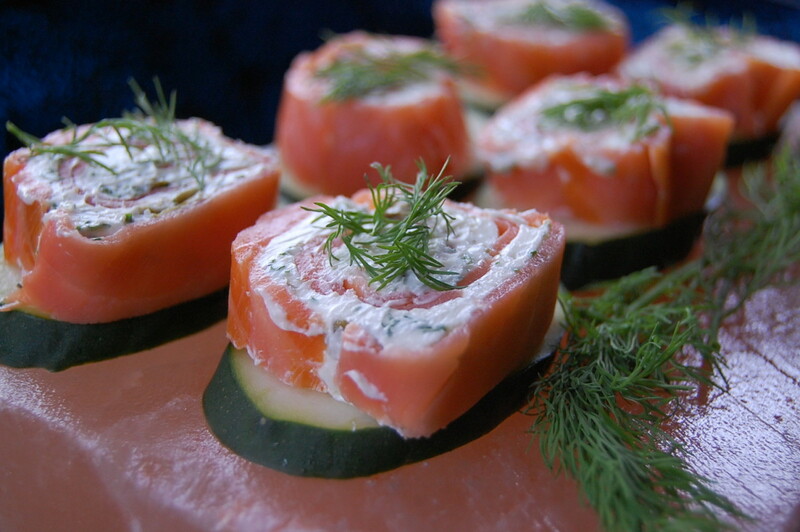 Extra-creamy dip: Add 1-2 Tablespoons sour cream, mayonnaise, or cream cheese and blend thoroughly. Tex-Mex flavor: Stir in 1 teaspoon of ground cumin. Add a few shakes of garlic powder for good measure. Spicy guacamole: Mince 1-2 jalapenos or another hot pepper. Garlic lovers: Add one garlic clove, pressed or minced. Guacamole makes a great spread for veggie sandwiches or pita pockets. Serve with veggie sticks such as carrot, bell pepper, and celery. Spoon over an omelette or scrambled eggs. Guacamole adds Southwestern flare to burgers. Use as a topper for grilled chicken breasts. Serve guacamole with Mexican dishes such as enchiladas, tacos, burritos, taquitos, tostadas and fajitas. Or try guacamole with your own homemade corn tortillas. Place two peeled, pitted and chopped avocados in a medium mixing bowl. 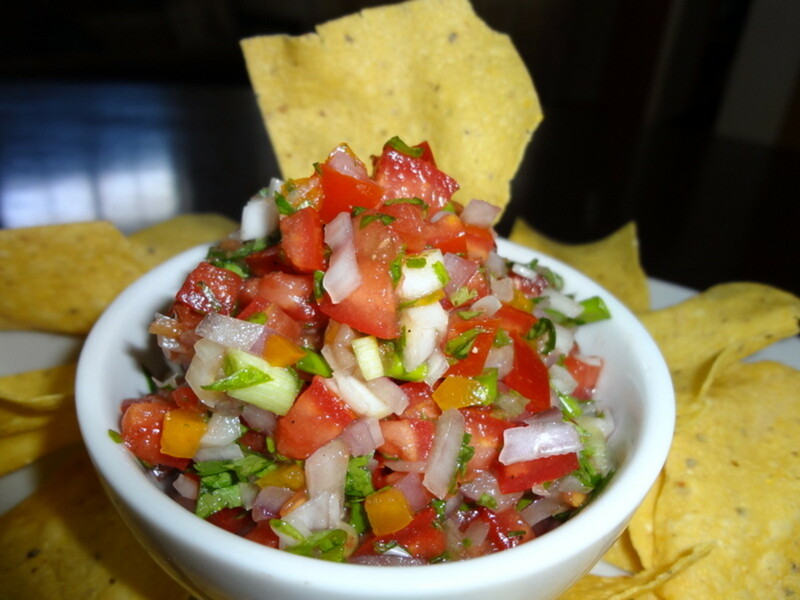 With a spatula, fold 2-3 tablespoons of The Best Authentic Pico de Gallo into the chopped avocados. Lime squeezers are, hands down, the best way to juice Key limes. Although OXO makes a respectable juicer, the Chef'n FreshForce juicer is my favorite for durability and ease of use. Kuhn Rikon, makers of the Mercedes of all garlic presses, markets a very interesting and unique avocado tool. 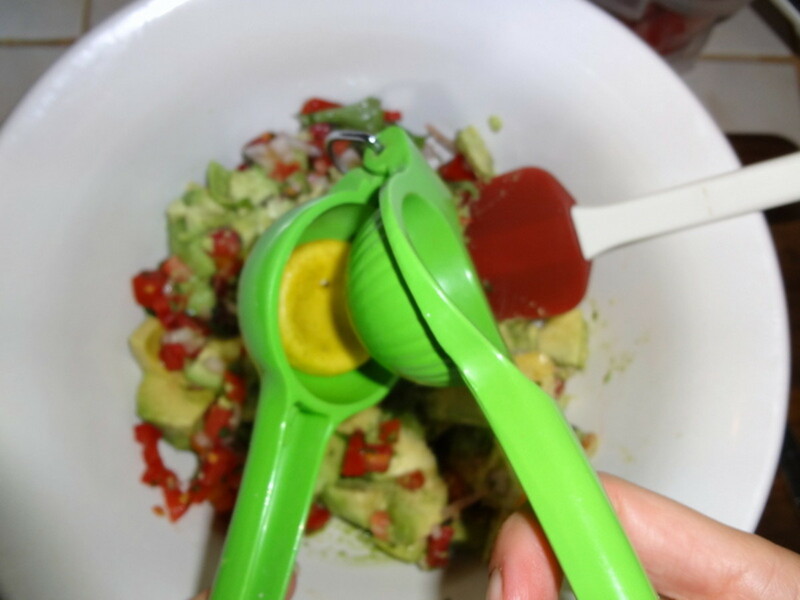 If you eat avocados frequently, this tool is a must-have. The serrated blade of Japanese carbon steel cuts quickly through tough skin while a nonstick coating ensures smooth cutting action. Dual prongs safely spear and remove pits, and the curved tip is perfectly arched to separate skin from flesh without leaving behind delicious avocado. A rounded handle provides comfort and control while cutting. Thank you for taking the time to comment Nancie M.
Love guacamole, and this recipe sounds like a winner. Thanks for tip about placing in the avocado pit in the guacamole to stop oxidization. Tamara14, I'm glad you're going to try this recipe on your friends! Thanks for sharing your experience in Croatia. Nice hub, thank you. Here in Croatia guacamole is more seen in Mexican restaurants than in homes and it's not that easy to get a really good guacamole recipe by just asking a friend :) This is going to be very helpful for my next home party with my friends. Thanks for making it so easy to follow with these great photos. Que Scout, I think store-bought guacamole in the US is unacceptable, so I can only imagine what it must be like in Australia, so far from the source. Anyone who's lived in Texas knows good Mexican food, so I'm sure the Aussies are impressed with your kitchen prowess. Thanks again for your review and I'm glad you enjoy this guacamole. 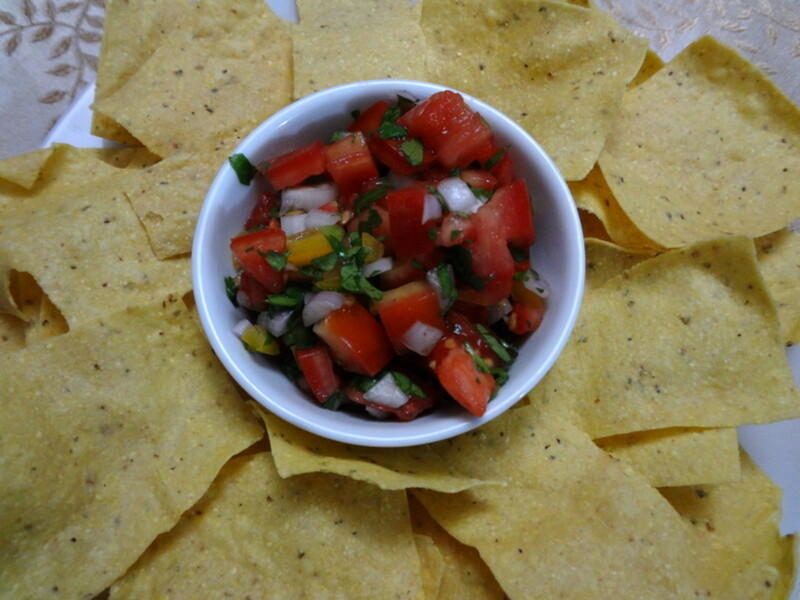 I also recommend "The Best Homemade Mexican Salsa Recipe", another delicious addition to this series. Que Scout, I'm happy you enjoyed this authentic guacamole! 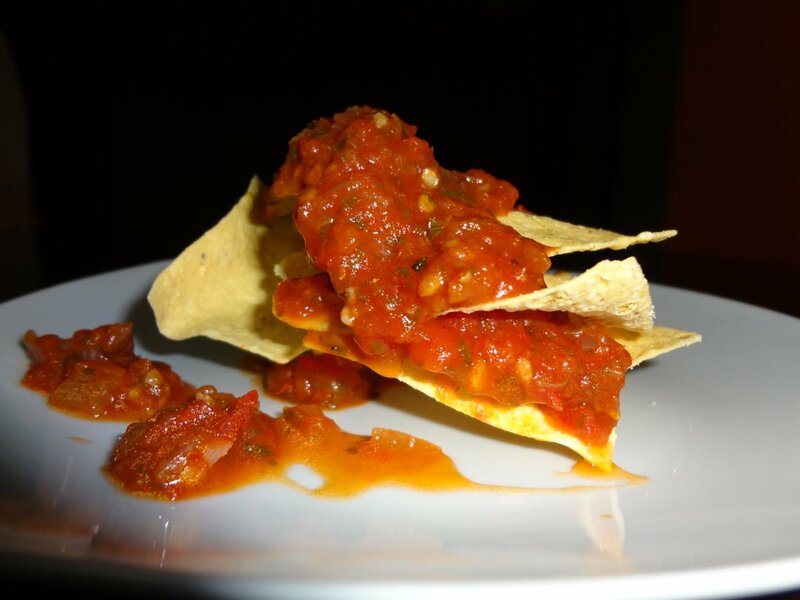 We also enjoy the diced chile pepper, although the hot pepper sauce is very popular in the U.S. I hope it becomes one of your go-to recipes for guests. Thank you for taking the time to leave your review! I made this one up as per your instructions. It is the most genuine Guac recipe. Do not add a liquid chilly, but only one hot red chili pepper, finely chopped. 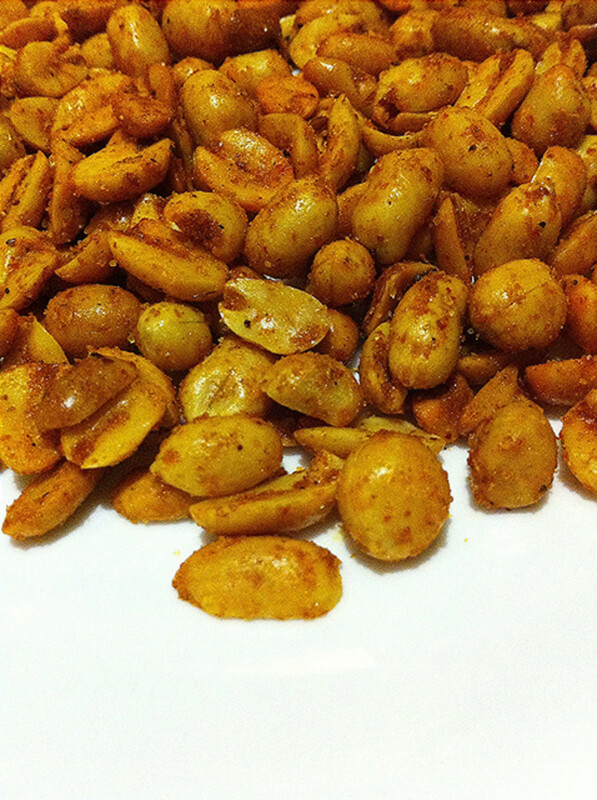 Resulting in a light chili flavor in the dip, and only HOT in different bites. This way at a gathering, those who hate the hot taste only get the odd bite which is hot. MikeRobbers, thanks for coming by! Guacamole ole ole! I love it! Thanks for the info vespawoolf. This is fantastic! I came to google on how to make guacamole and landed here. My daughter and I love avocado and we have other ways to eat it but I just bought a bag of crisp nachos from Mexico and feels like making guacamole. So, this is perfect! Great photos and just awesome hub. I didn't know about the plastic wrap and the kosher salt. So, thanks for the info. Voted up and sharing the goodness! SINewsome, I'm glad you enjoyed the photos. Enjoy and thanks for coming by! I'll need to try this! Nice photography. KoffeeKlatchGals, thanks for sharing! I hope you and your daughter enjoy the guacamole. It's one of our favorites, too, and delicious with so many foods. I just love avocado in any shape or form. This recipe is awesome. I will be sharing and sending directly to my middle daughter. She loves guacamole. CZCZCZ, I'm glad you enjoyed my hub. Guacamole is all about fresh ingredients and technique for the right texture and flavor. Thank you for coming by! Loved your guacamole recipe this looks very delicious! Thanks for all the great tips on making an excellent chip dip. Tebo, I'm glad you learned something new about keeping the guacamole green and that the quiz was informative, too. Thank you for taking the time to read and comment. Anil and Honey, I'm glad this hub taught you something new. Thank you for commenting! I love avocados and guacamole. Your recipe sounds and looks delicious. Thanks for teaching me that the pit will prevent guacamole from going brown and I enjoyed taking the quiz. First time only 50%, but 100% second time meaning you have taught me heaps. Through this hub I could study something new, I can see some similar things. of two countries (India and your country) through hub. Au fait, I'm glad you enjoyed the tip for keeping the guacamole green. Enjoy! 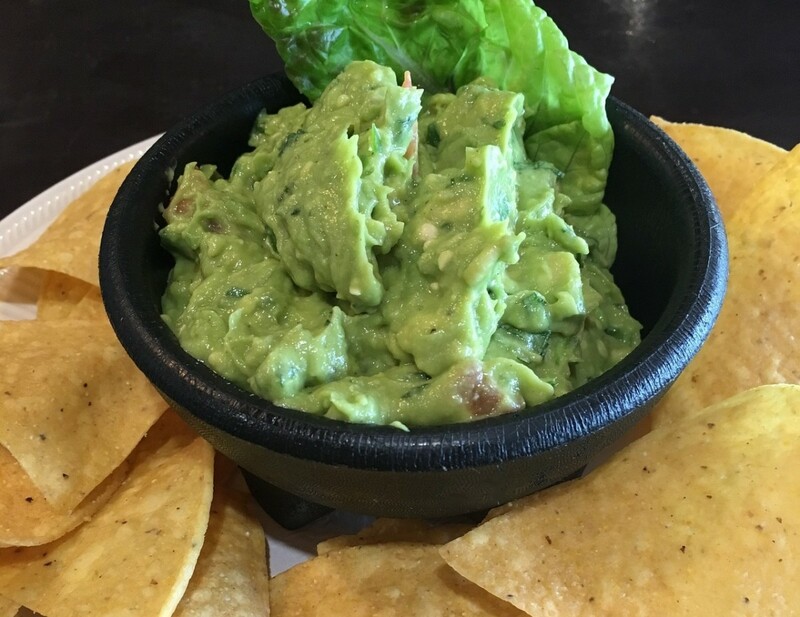 Guacamole is one of our favorites since we have an abundance of inexpensive avocados and they're healthy and delicious, too! I love guacamole and I didn't realize it was made with so few ingredients. Going to bookmark this recipe so that I can try it soon. I have wondered too, what would prevent it from discoloring. I would never imagined something so simple as putting the avocado pit into the guacamole would solve the problem. Great hub, voted up, useful, and will share! Also gave you 5 stars! I'm glad you enjoyed this recipe, Peggy W. The Key limes really are a great complement to the avocados. Enjoy and thank you for the comment and votes! Just looking at your photos have me salivating and wanting some good guacamole. Will have to get some avocados and some key limes and the rest soon! Love your alternative suggestions for recipes. All of them sound good to me. Up and useful votes. Thanks! Jill, I'm glad you appreciate the tips. The pit does help, but I find the Key lime juice even more effective. Thank you for coming by! Oh my goodness I LOVE guacomole! I seriously do eat it by the spoonful ^_^ Your recipe looks amazing and I will certainly try it!! Thank you ^_^ I wish I would have seen this one sooner! Voting pinning and sharing! Suzie HQ, hearing from you is a great way to start the day! How's Ireland treating you? I'm glad you found this recipe useful. I never get tired of guacamole! Enjoy and thanks so much for the cheerful comment, vote and share. 2patricias, I'm glad you found this useful. If avocados have to be imported where you live, it is harder to find those that are just perfect for guacamole. You may have to put them in a paper bag and leave them on the countertop for a few days unti they're softer. Enjoy! Thanks so much for coming by again. HOW'D I MISS THIS? I am a huge Guacamole fan. Love it with chips potato or tortilla varieties. 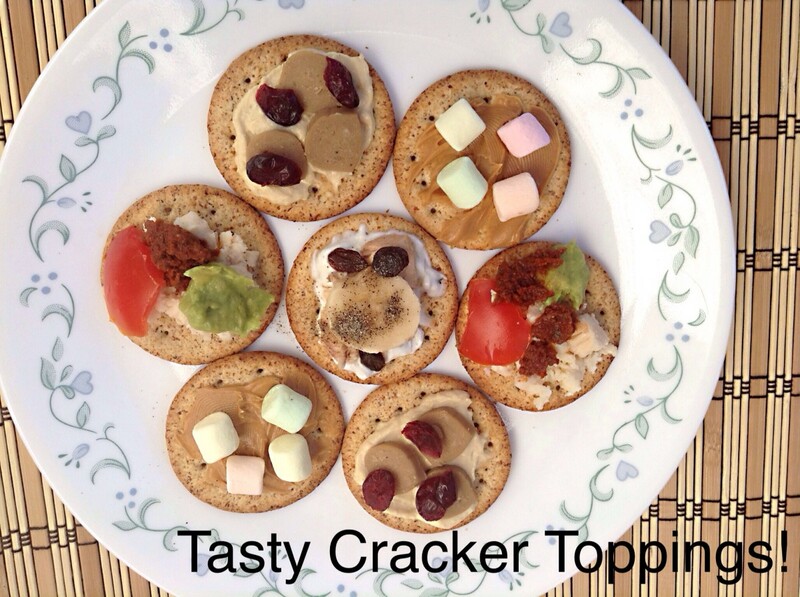 This looks and sounds delicious along with being ultra easy peasy! Great step-by-step pics as always and loved your intro about your recent trip. I would be in heaven as I love Avocados! Thanks for including some alternative ideas, I would have thought garlic was part of the authentic one! Amazing! I really like the tips on choosing an avocado. I really like avocado, but am often disappointed. I have added this to my Recipe Index for HubPages. I made this today! It was delicious. I added cumin and a hot pepper from my garden. Yum! Millionaire Tips, it's nice to hear from you again! I should've taken a tip from your hubs and written one just about the tour of the avocado grove. It was fascinating. Thanks for taking the time to read and comment! This look so delicious, you are making me hungry. I just bought some avacados for the first time, so this recipe came at just the right time! Voted up. Thanks for the avocado facts and the tour of the grove! You're right ptrg777, using the knife makes it so much easier to remove the pit. I'm glad you enjoyed the recipe. Thanks so much for coming by! Taking the pit out can be a pain so slicing it is a great idea! Good recipe and easy! Susiebrown48, it's nice to meet a fellow guacamole lover! I'm glad you found the tips helpful. Thanks so much for taking the time to read and comment. I really appreciate it. I love the hub and really appreciate the advice on how to chop the avocado by slicing it still in the shell! What an innovative idea! I also like the idea of using guacamole on my pita sandwiches. Thanks for a great hub with beautiful pictures. Voted up and awesome! Oh my goodness, it should be easy to find Key limes in Miami! They're so worth it. I still enjoy lemons, but there's something special about a Key lime. Thanks so much for commenting, kristinnicole23! Jackie Lynnley, I'm glad you enjoyed the recipe. You certainly don't have to throw away the seeds; it's just a personal preference. I find it makes the guacamole too watery. I do eat the seeds in other dishes, though. Thanks so much for yoru vote and comment! It's always nice to hear from you. Wow I have to save this and frame it, it looks so good! I make a good Guacamole too, but I know this will be better. You have to tell me though, you and Rachel Ray, throwing away the tomato seed? I love the seed flavor and it is so pretty...? VictoriaLynn, avocados don't need much tweaking to be delicious! In Peru, it's common to smash the avocado, salt it and enjoy it as a sandwich. I hope you enjoy the recipe and thanks for coming by. I love guacamole and make it very simply without too many extra ingredients, but this looks amazing! I love it chunky, too. Will have to try this one! ChristyWrites, thanks so much for reading! Your photos are really helpful with the steps. Yummy! Yeagerinvestments, the kosher salt and Key lime really make it special. Thanks for stopping by! I love Guacamole dip! I make it at least 2 nights per week and this is how I usually make it. Great recipe! Mrs. Menagerie, thanks so much for your enthusiastic comment and vote! Fantastic hub, narration and recipe!!!! I LOVE avocados and guac! Voted up! Sgbrown, I'm glad the hub inspired you to try Key lime and kosher salt. Enjoy the guacamole! I'm going to make some today, as well. Thanks so much for the comment and vote. Have a great day. I love good guacamole! I am going to try to key lime juice instead of lemon juice and the kosher salt. You made me hungry for guacamole now, going to the store today, bringing home avocados! Great hub, love the pictures and your story. Voted up and awesome! Charlu, I'm glad you enjoyed all the details on avocados. Guacamole is actually quite versatile, and I love the addition of Key lime juice. Thanks so much for taking the time to read and comment! Awesome hub with such great tips for ripening and a variations for recipes. I also love the having it with potato salad. Voted up useful and interesting and thanks for posting the link in my question. I did add a comment because the link was an edit link, but I still got here through your profile. Thanks again. Kelleyward, traditional guacamole is my favorite. Thanks for taking the time to vote and comment. Thank you for this. I know you wrote this just for me. Ellebyam, I'm glad you feel inspired to try guacamole! Although avocados are delicious eaten as a dessert, I have to confess this way is my favorite. Enjoy and thanks so much for commenting and voting. I enjoyed reading this classic recipe hub. And I am now convinced to try it. All my life I have only eaten avocado as a quick dessert, mashed combined with milk and sugar and chilled before eating. If I have extra time, I make avocado ice cream. Thank you for sharing this great hub. I am following your lead and voting all the way up. Thanks for coming by, Glimmer Twin Fan! 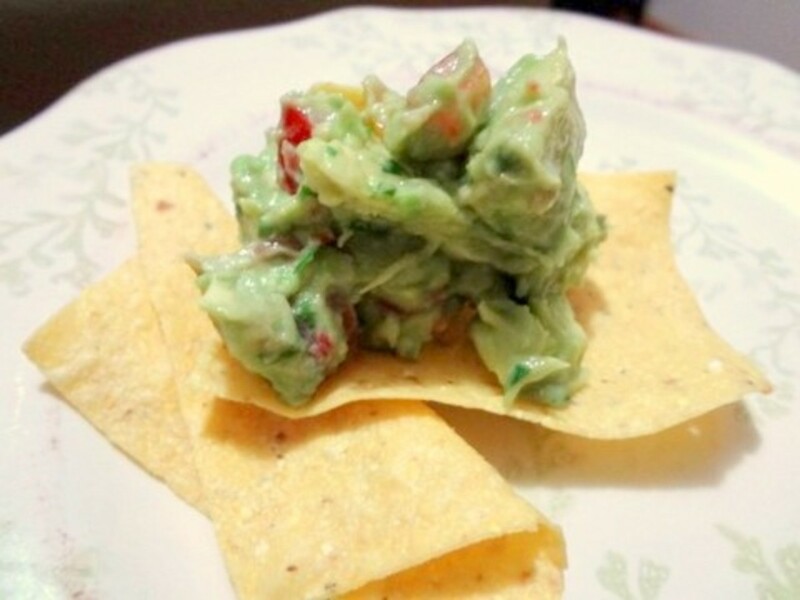 Guacamole is the best and this recipe looks delicious. I really like all the textures in this.